My best friend's brother & his wife had a baby boy 6 weeks ago now! Wow, that has gone fast. Anyway, last weekend, the proud grandparents had a small party to welcome baby Lachlan and to meet him. As I hadn't managed to get out to see Lachlan yet, I was more than happy to be invited. He is adorable too. So, naturally I had to make a card. I used the same sketch from THIS post for this card. It is such a fun and easy sketch to use. You'll no doubt be seeing a lot of this. Gosh, my photos aren't turning out very clear are they? This one is a little blurry so sorry about that. I was in a bit of a hurry making this and getting it photographed so this will teach me to make things in advance and take my time! LOL. Ink: Not Quite Navy, Not Quite Navy Marker. Paper: Kraft, Very Vanilla, Not Quite Navy, Bella Bleu DSP. 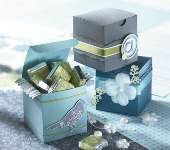 Accessories: 5/8" Very Vanilla Grosgrain Ribbon, 1" Circle Punch, 1 1/4" Circle Punch, Scallop Edge Punch. I have missed the last few cyberstamp nights that the INKlings have held and I didn't want to miss this one which, was held last Sunday and hosted by Fiona. Thanks Fiona for a fun night and great challenges. The first challenge was a sketch from HERE. I knew straight away what kind of card I was going to make. Dani, a fellow INKling had a baby girl last Friday and I really wanted to make something for her. This is it. I stamped my 'Wild About You' animals in Riding Hood Red and then used my 1" punch to cut out only part of the image. I layered them on Pink Pirouette and tapped my Riding Hood Red dauber around the edges to make it stand out more. I think it worked! I'll be back later with the second challenge. Stamps: Wild About You, Nursery Necessities. Paper: Pink Pirouette, Riding Hood Red, Barely Banana, Whisper White, Riding Hood Red Patterns DSP. Accessories: 5/8" Riding Hood Red Striped Grosgrain Ribbon, 1" Circle Punch, 1 1/4" Circle Punch, Scallop Edge Punch. Our friends in the UK had a baby girl a few weeks ago so I needed to make a card for them. I really like how this turned out. 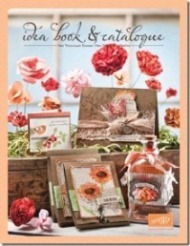 Thank goodness for the Idea Book & Catalogue because this is where this card came from! If you are ever stuck and don't know what kind of card you want to make, just take a look in the catalogue current or past ones and the inspiration will come. Another quick and easy card to make - great for mass production as a baby announcement (will have to keep this is in mind come September!). I used my white craft ink for the big star with clear embossing powder but I should have used white powder to make it stand out a bit more. I still like it though but must remember for next time. My bow turned out pretty good too (if it do say so myself!). I can't always get a good bow when using the wider ribbon. Stamps: Nursery Necessities, Nursery Letters Jumbo Wheel. Ink: Certainly Celery, Chocolate Chip, Whisper White (craft). Paper: Certainly Celery, Chocolate Chip, Pretty In Pink, Whisper White. Accessories: Star Punch (large & small), 5/8" Certainly Celery Grosgrain Ribbon, Word Window Punch, Paper Piercing tool & template, Dimensionals, Pretty In Pink Brad.